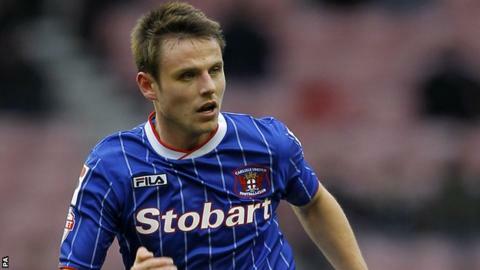 Relegated Carlisle United have released 11 players but have offered new contracts to midfielders Paul Thirlwell and James Berrett. Berrett, 25, will consider a two-year deal, while Thirlwell, 35, has a one-year option from boss Graham Kavanagh. Patrick Brough and Kyle Dempsey, who played first-team football last season, have one-year professional contracts. Striker Lee Miller plus midfielders Chris Chantler and Liam Noble are among those to depart Brunton Park. The Cumbrians' relegation from League One was confirmed after Saturday's defeat by champions Wolves in the final game of the season. Players released: Chris Chantler, Danny Livesey, Prince Buaben, Liam Noble, Lee Miller, Mike Edwards, Greg Fleming, Jack Lynch, Lewis Guy, Nacho Novo and Pascal Chimbonda.